The base V6 engine gains an automatic stop-start system for 2016 to improve fuel economy. There is also a new Sport mode standard on all models, which alters steering calibration, throttle response and transmission shift programming. The R/T trim gains a multitude of standard equipment while new special appearance packages (Platinum and Brass Monkey) debut. It’s safe to say that the three-row crossover has become the vehicle of choice for moms and dads everywhere. Just like the minivan and wood-trimmed station wagon before them, they’re roomy and packed with features to keep the kids happy/distracted. They also have all the personality and flair of your refrigerator. Well, typically at least, because the 2016 Dodge Durango is a three-row crossover that offers an ample amount of style, personality and even old-fashioned American muscle. Although the most basic Durango can be a bit blah, moving up to higher trim levels or opting for one of several appearance packages allows it to stand apart from the Honda Pilots and Toyota Highlanders of this world. Its available V8 engine does the same — not only from a smoke-’em-off-the-line perspective but should you need to tow something as well. Indeed, even the V6-powered Durango can lug around much heavier trailers than its competitors can. At the same time, the Durango delivers practical needs better than many. Not only will kids find plenty of space in the back, even adults can be comfortable in the third row, a feat not shared by all competitors. There are only a maximum of seven seats available, but since the eighth seat in so-equipped competitors is often of negligible use, this may not be a significant obstacle. Yet, while the 2016 Durango provides a desirable, distinctive mix of practicality and personality, there are certainly downsides that result in its receiving a “B” rating from our editors. Its significant weight hampers acceleration, handling, maneuverability and fuel economy relative to newer competitors like the Honda Pilot, Mazda CX-9 andToyota Highlander. The Durango’s cabin also isn’t as stylish or of the same quality as those competitors. The gap between the Durango and those competitors isn’t an enormous one. Also, this big Dodge could prove to be an appealing alternative to even bigger, heavier and thirstier full-size, truck-based SUVs like the Chevrolet Tahoe and Ford Expedition for those who need more capability than the typical crossover. Either way, we recommend moms and dads everywhere at least consider the Durango. 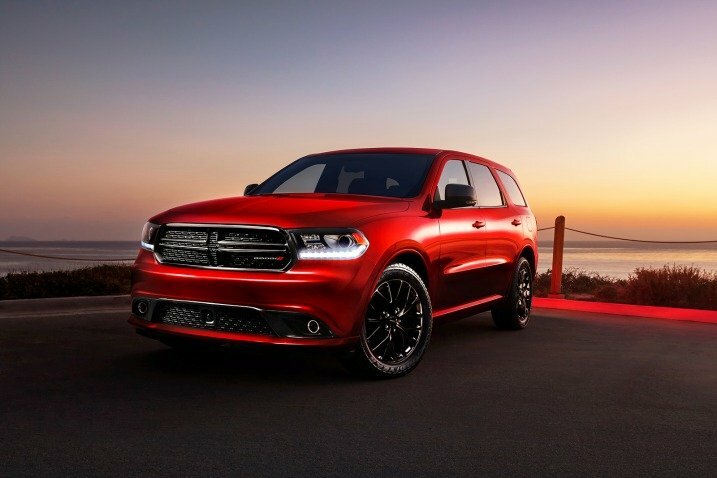 The 2016 Dodge Durango is a three-row crossover SUV available in four trim levels: SXT, Limited, Citadel and R/T. Seven-passenger seating is standard on all, while second-row captain’s chairs that reduce capacity to six are optional on all. The base SXT comes standard with 18-inch alloy wheels, a load-leveling rear suspension, adjustable drive settings (Sport mode), automatic headlamps, foglamps, heated mirrors, keyless ignition and entry, cruise control, three-zone climate control, a height-adjustable driver seat, a 60/40-split folding and reclining second-row seat, a 50/50-split folding third-row seat (with power-folding headrests), cloth upholstery, a tilt-and-telescoping steering wheel, an auto-dimming rearview mirror, Bluetooth phone connectivity, a 5-inch touchscreen interface (Uconnect 5.0), six-speaker sound system with an auxiliary audio jack, a USB port and a media player interface. There are several notable SXT options. The Customer Preferred Order package adds roof rails and crossbars, an eight-way power driver seat with four-way lumbar adjustment, a leather-wrapped steering wheel and satellite radio. The Popular Equipment Group adds rear parking sensors, a rearview camera, heated front seats, a heated steering wheel and Bluetooth audio connectivity. The Uconnect 8.4 system adds an 8.4-inch touchscreen interface, satellite radio, voice controls and emergency services. A sunroof can also be added separately. Apart from the sunroof, all of the above is included on the Limited plus LED running lights, remote ignition, power-folding mirrors (driver auto-dimming), driver memory functions, six-way power passenger seat, heated second-row seats, leather upholstery and an extra charge-only USB port. The Nav & Power Liftgate Group adds navigation software to the Uconnect 8.4 system along with a power liftgate and HD radio. The Premium Group adds those items plus 20-inch wheels, a sunroof, different exterior trim and a Beats audio system. The Safety/Security & Convenience Group adds HID headlamps with automatic leveling and high beam control, automatic wipers, blind-spot and rear cross-path warning systems, a cargo cover and net, and a power-adjustable steering wheel. Optional on both the SXT and Limited, the Rallye Appearance package deletes the roof rails and adds 20-inch black wheels, 5 extra horsepower and additional body-color exterior trim. The Citadel includes the Nav & Power and Safety/Security & Convenience group items plus 20-inch wheels, upgraded brakes, 5 extra horsepower, chrome exterior trim, the sunroof, additional leather interior trim, an eight-way power passenger seat, ventilated front seats and a nine-speaker sound system. The Citadel can be equipped with the Premium Entertainment Group that adds the Beats audio system, and a rear entertainment system that includes two screens and a DVD/Blu-ray player. 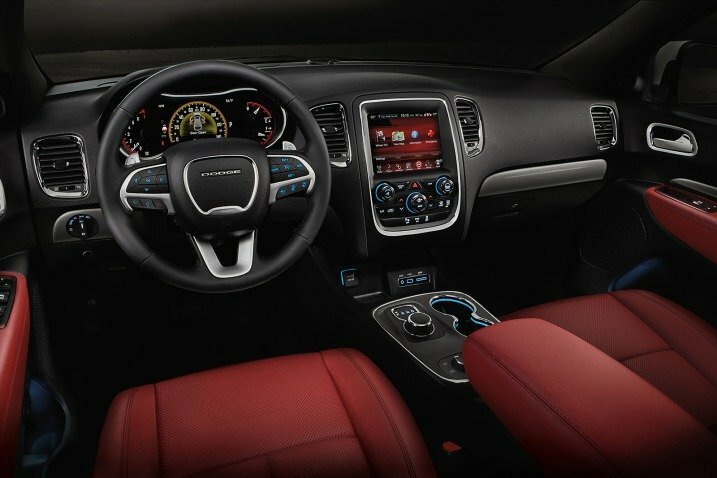 The R/T differs with a V8 engine, a lowered sport-tuned suspension, performance steering, body-color exterior trim (in place of chrome), upgraded leather upholstery, and the Beats audio system. It does not include roof rails or the sunroof, but the latter can be added separately. The rear entertainment system can be added separately. Optional on the Citadel and R/T is the Technology Group, which adds adaptive cruise control, a forward collision warning and emergency braking system, a blind-spot warning system and rear cross-traffic alert. Optional on SXT, Limited and R/T is the Blacktop package, which features gloss-black 20-inch wheels, a gloss-black grille, Rallye-style body-color exterior trim and other minor blacked-out exterior trim. All Durangos can be outfitted with a towing package that includes a heavy-duty alternator and oil cooler, load-leveling rear shocks and a full-size spare tire. A CD player is also a stand-alone option on all Durangos. On all but the SXT, a center console with storage and a USB port can be added to the optional second-row captain’s chairs. With the exception of the R/T, every 2016 Dodge Durango comes standard with a 3.6-liter V6 good for 290 horsepower (295 on Citadel or with Rallye or Blacktop packages) and 260 pound-feet of torque. An eight-speed automatic and rear-wheel drive are standard, and all-wheel drive is optional. An automatic stop-start system is also standard that shuts down the engine when the car stops in order to save fuel. EPA fuel economy estimates were not available at the time of this writing, but expect them to be around 20 mpg combined. Properly equipped, the Durango V6 can tow 6,200 pounds, which is considerably more than most competitors. In Edmunds testing, a Durango V6 with RWD accelerated to 60 mph in 7.8 seconds, while one with the V6 and all-wheel drive did it in 8.1 seconds. These represent acceptable acceleration, but are well off the pace of the segment’s best. 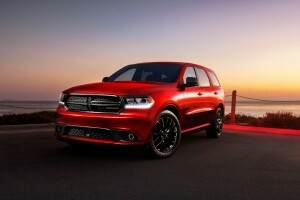 A 5.7-liter V8 good for 360 hp and 390 lb-ft of torque is standard on the R/T and optional on the Citadel. It, too, has an eight-speed automatic and rear-wheel drive standard, while its optional all-wheel-drive system includes a low-range transfer case for improved off-road performance and a neutral position that more easily allows for flat-towing. Though fuel economy estimates also weren’t available for the V8, given that it didn’t get auto stop-start for 2016 we expect last year’s estimates of 17 mpg combined (14 city/23 highway) with rear drive and 16 mpg combined (14 city/22 highway) to carry over. It can tow a maximum of 7,400 pounds — only truck-based SUVs can do better. 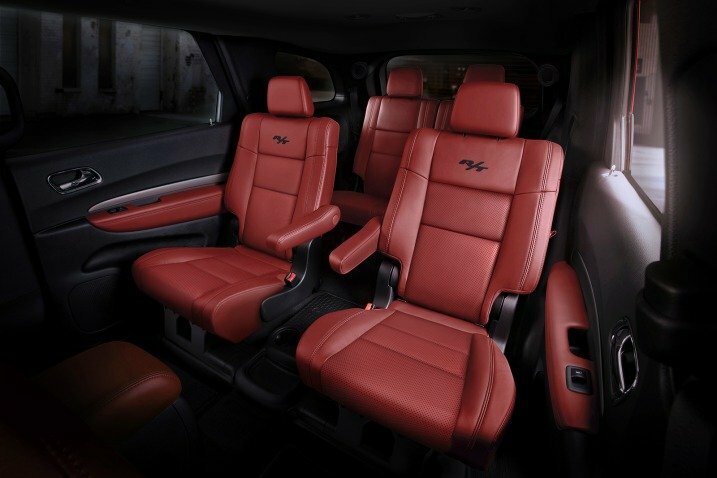 Standard on every 2016 Dodge Durango are antilock disc brakes, stability and traction control, trailer sway control, front side airbags, a driver knee airbag and full-length side curtain airbags. A rearview camera and parking sensors are optional on the SXT and standard on all other Durangos. The Uconnect 8.4 system offers emergency assistance and stolen vehicle tracking. The Safety/Security & Convenience Group includes blind-spot warning and rear cross-path alert systems. The Technology package, available on R/T and Citadel, adds a forward collision warning system that sounds a chime and can also tap the brakes to alert you when a collision seems imminent. If the driver doesn’t respond by braking, the system will automatically apply the brakes to avoid or mitigate a collision. In Edmunds testing, a Durango Limited V6 with rear-wheel drive came to a stop from 60 mph in 124 feet, while one with all-wheel drive did it in 125 feet. Both distances are average for this segment. In testing of last year’s essentially identical Durango, the government gave it four stars out of five for overall crash protection along with four stars for frontal protection and five stars for side protection. The Insurance Institute for Highway Safety (IIHS) awarded the 2015 Durango its highest score of “Good” in the moderate-overlap frontal-offset, side-impact and roof strength crash tests. The Durango’s seat/head restraint design was also rated “Good” by the IIHS for whiplash protection in rear impacts, and Dodge’s big SUV earned the middle “Advanced” rating for frontal crash prevention when equipped with the Technology package. Families who spend lots of time in the car would be wise to consider the road-trip-ready Durango. It’s comfortable, quiet and while some competitors offer seatbelts for eight, it’s usually just a token provision. In reality, the Durango offers more useful passenger space. This is especially true in the third row where adults can actually sit comfortably, which is rare. The rear doors are also enormous and open to nearly 90 degrees, making for easier ingress and egress — aided further by a flip-and-fold second-row seat. Materials quality is unremarkable for the segment, which says more about the segment itself, as there are plenty of soft-touch surfaces to be found and minimal cheap ones. It’s just that other, newer competitors are nicer while having more compelling and visually interesting designs to boot. The mechanically related Jeep Grand Cherokee also has a plusher interior. However, the Durango has a leg up on most competitors when it comes to tech interfaces. The standard system is user-friendly, but we highly recommend the superior Uconnect 8.4 system that boasts large virtual buttons, logical menus and helpful secondary physical controls. Whether tech-savvy or tech-averse, it’s one of the best systems out there. The Durango’s maximum cargo capacity of 84.5 cubic feet is competitive for the segment, while its 47.7 cubic feet behind the second row is similarly large. The space behind the third row is limited as expected, but it is at least wide and deep enough for a large golf bag. It also features an available cargo cover that can conceal the area behind both the second and third rows if needed. The Dodge Durango is heavy for its class. The Honda Pilot, for instance, is a whopping 700 pounds lighter. As a result, the Durango’s V6 engine can feel taxed compared to some competitors and its handling can feel lethargic. Its slow, trucklike steering doesn’t help things either even if it boasts decent precision and weighting in normal driving situations. If you’re used to a bigger, truck-based SUV, the Durango should feel pleasantly maneuverable. If, however, you’re coming out of a smaller SUV or a car, it could be a bit overwhelming. One area where the Durango’s weight helps is the ride quality. There’s a resolutely buttoned-down feel to the way it rolls down the road. We even found the ride comfortable when outfitted with big 20-inch wheels. Those who appreciate big, old-school truck-based SUVs will feel right at home, albeit without the uncouth jiggling and occasionally harsh ride motions. 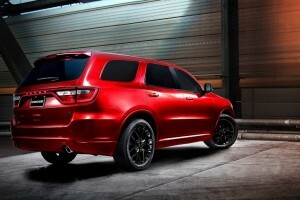 Now, if the Durango’s weight is an issue and spending more on gas is not, the Hemi V8 could be the way to go. It offers unmatched power and towing capability for the three-row crossover segment, along with an ample degree of guts that would make the muscle cars in the Dodge garage proud.